In Russia there’s no time for “summertime sadness.” The climate and beauty of the changing of the seasons into fall beckons exciting and unforgettable journeys all across the country. Here’s a list of the best fall trips in Russia. Just like summer, early fall is the best time to discover the beauty of Russia. So, if you haven’t yet fulfilled your dream of experiencing the diversity of the world’s biggest country, don’t miss your chance to see it this fall. As Albert Camus once said, “fall is a second spring when every leaf is a flower.” In the case of cities such as Vladivostok the climate is shifted a few months back. This means that September and October have just as much to do with summer as fall and often are the best months for sunbathing, swimming and relaxing on the beach. And the fall shades of the hills together with the sparkling blue ocean create a stunning fusion of colors highlighting the region’s allure. The rich colors of a Siberian fall paint the region in beautiful shades as if they’ve been waiting all year to do this. This is the perfect time to wander the region’s numerous open-air museums that display the unique heritage of traditional Russian wooden architecture. The region also boasts many traditional activities such as going to the banya (sauna) and participating in a traditional Russian tea ceremony with an old-fashioned samovar (tea kettle). The mountainous Altai region is happy to show off its dazzling beauty any time of the year, but beginning in September - when natures paints its canvas thick with fall colors - it is a true marvel. Horseback rides in the mountains overlooking crystal blue lakes and the views created by the changing of the seasons are a breathtaking experience. Soaking in the healing waters of the Dzhumalinskie hot mineral and thermal springs is another popular activity for your fall getaway. The Golden Ring towns that surround Moscow combined with the red and gold colors of fall promise the adventure of a lifetime. These ancient towns, located just a few hours from Moscow, possess impressive rare examples of old Russian architecture. Among the must-see places here are the Kremlin in Rostov Veliky (near Yaroslavl) and the Museum of Wooden Architecture and Peasant Life in Suzdal. The sprawling country estates and wooden churches that dot the colorful landscapes look like they’ve come straight from the pages of Russian fairy tales. All Russians know that fall is the beloved season of its national poet, Alexander Pushkin. It is also the best time of year to travel to St. Petersburg. Don’t miss this opportunity to marvel at the city’s masterpieces of landscaped art, such as the 18th century Summer Garden, which at this time of year is clothed in shades of yellow, red and orange. Taking in a fall sunset over the Gulf of Finland is another awe-inspiring view that you don’t want to miss. Enjoy the landscape’s soft colors and a glass of mulled wine at one of the country clubs located along the shore north of the city center. Set sail on the mighty Volga River from Moscow to Russia’s south. During the cruise the vessel makes stops in many off-the-beaten path destinations along the river’s banks. 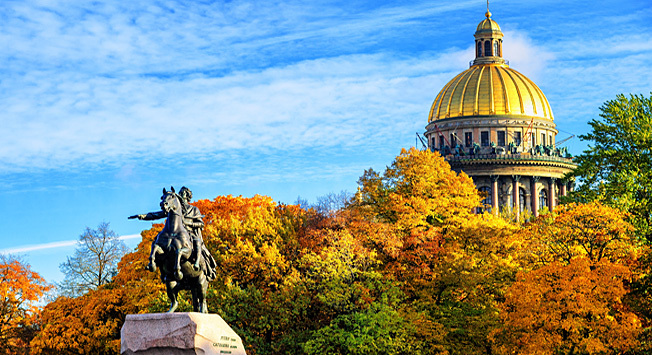 This is the perfect chance to enjoy the beauty of authentic old Russian architecture, temples and cathedrals in the light of the warm sun and the rustling fall leaves. The landmarks of Kazan, a city that considers itself Russia’s third capital, and the nature surrounding Astrakhan leave a lasting impression of the country’s vast riches and diverse culture. If you want to extend your summer and catch more sun before it fades to winter go to the south. Locals traditionally call the early fall months “the velvet season” and this statement is fairly accurate. The heat of the July sun is gone, yet the temperature is warm and the water in the Black Sea is just right for a long swim. The streets, cafes and beaches of the holiday-resort cities aren’t jammed with crowds of tourists, and the atmosphere is all about relaxing, getting in touch with nature and having a good rest. For those looking to change their scenery, Sochi’s Krasnaya Polyana features some of the country’s best ski slopes and offer incredible views and entertaining activities year round. About the author: Slava Shirokov is a Russian native, keen traveler and a CEO at Travel All Russia, a destination management company specializing in premium Russia package tours.